90 minutes! Today I presented at Gnomedex 8.0. (My slides are here). 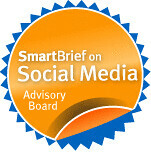 I started with a story about how Ponzi and Chris helped me demonstrate the networked effect with flickr and twitter for a nonprofit training, then told my story about the Case Foundation and Parade Magazine's America's Giving Challenge, and then I set up a real time fundraising challenge. 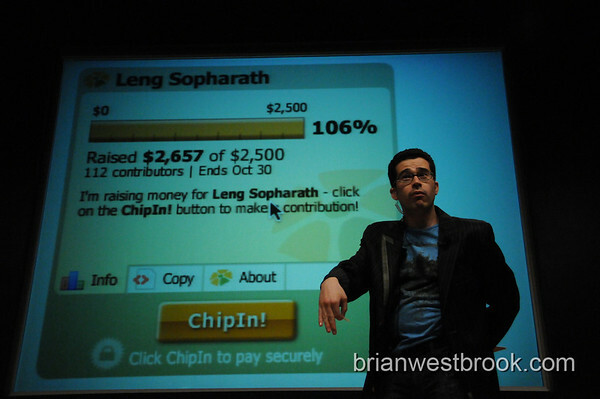 My first fundraising effort was to send Leng Sopharath to college her first year in November 2006 took 3 weeks to raise $800. In 2007, Chris Brogan and 81 other people helped raise enough money in 24 hours for her college tuition and in a few days were able to raise enough to help support another student. So, my challenge was: Can this room of highly connected gnomedexers get 250 people to donate $10 by the end of the conference? Buzz Bruggeman (above) said pass the hat. Then I answered questions. What I didn't see going on was the back channel (captured by Marshall K in Iterasi in a cool slide show). Geoff Livingston kicked it off by tweeting his donation. Later Jeremy Wright kept tweeting out matching challenges. At 90 minutes, we raised $2,657 from 112 donors - plus whoever gave cash (probably another 125 people giving a total of $902). Thank you. The ball kept rolling - the combined total as of $3,774. THANK YOU GNOMEDEXers and everyone who contributed. YOU ALL ROCK. We're solving real problems! Very cool. This is the power of the network effect as developed by you Beth. It was most impressive! awesome, beth, you are a wonderfully kind human being and i am proud to know you. you are changing the world! I was able to see it all happening on twitter ... Pretty amazing stuff. I have been looking for good examples of people using twitter and other social media to fundraise. This one is at the top of the list. Using twitter to 'spread the word' gives a whole new meaning to the phrase! Thanks for keeping us up to date and informed with what's going on at the conf. Now how do we get MORE people to do this? This is a great tool and has worked well in this case. I have the following question. If many people and nonprofits adopted this method of fundraising would it flood the market and become less effective? Is the success due to the novelty? I don't mean to be cynical, but merely ask the question about its sustainability. John asks a good question about whether this success depends on the novelty. It's a good question and don't have an answer. What stands out to me is stories. When you told us about Leng Sopharath's surgery, I gasped. From your stories she was no stranger to me. Tools and techniques may get worn from overuse, but new stories can always be told. The fund raising is an impressive story, really just floors me! Still I think it's important not to focus too much on the "how" of it and retain attention to how important telling stories is for all of us. My donation was from Strands. We love you! Beth: Your preso was very moving. Congrats on winning the nerds over! We loved it! Also good getting to know you better at the event. 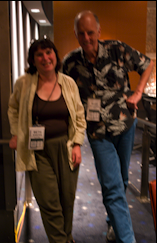 Beth, your presentation was wonderful, and I was very happy to get to meet you in person. Keep up the great work! The Power really is in the Network. Want to support Beth and help her raise even more money for Cambodian kids? Digg this story: Gnomedex 8.0 raises $2,500 for Cambodian kids... in 90 mins! Answer: about 90 minutes. Not too shabby and a great example of social media at its finest.